Contact Gordon Dry if you are interested in playing for EASTS. Junior players please see the Junior Club Website for further information about playing for EASTS. Since its establishment the club has clearly become the strongest in Wellington. The Royal Visit Cup is awarded to the Club scoring the most championship points in the season and has been won by the Club in 22 of the past 25 seasons. During the 2013/2014 season it added the Norwood Club championship for the club with highest average per team. In the 2017-18 season the Club fielded 24 senior teams and 38 junior teams. 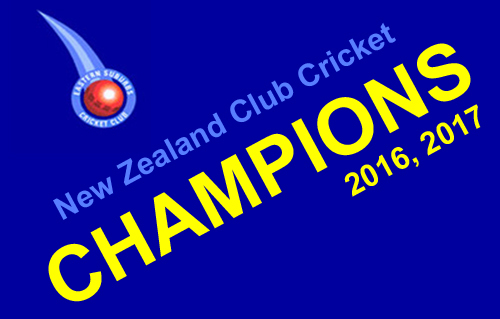 Easts are now the largest cricket club in New Zealand !!!! In individual grades it has won the Premier trophy, the Pearce Cup, for 15 years in 17 seasons. This has not been achieved in Wellington cricket since its "ancestor" Midland did it over a hundred years ago. The Club was established in 1993 following an amalgamation. It was made up of three clubs: Midland, dating from 1883, Kilbirnie, dating from 1890, and St Pat’s Old Boys, dating from 1936. In 1971 Midland and St Pat’s combined to form MSP, which became the last club to play and practice at the Basin Reserve. Its clubrooms have now become the new headquarters of Cricket Wellington. MSP and Kilbirnie amalgamated in 1993 to form Eastern Suburbs Cricket Club. In this period of more than 100 years, the 3 clubs have produced 29 New Zealand cricketers, as well as scores of Wellington players. Of these the undoubted top man was the Club’s former patron, the late Eric Tindill. As well as being the only person to have played in test matches for New Zealand in both rugby and cricket, he officated as umpire or referee in tests in both codes and acted as Wellington selector. Other outstanding players range from Blacklock and Upham, who were amongst New Zealand’s earliest representatives, to Barry Sinclair who captained New Zealand, Bruce Edgar, Wellington’s highest run scorer as well as most successfull opening batsman for New Zealand, and Stephen Fleming ONZM former captain of New Zealand from 1996 to 2008. Stephen was known for his astute tactical abilities, he is New Zealand’s 2nd most capped test player with 111 appearances, longest-serving and most successful captain, having led the side to 28 victories and having won Test match series against India, England, West Indies, Sri Lanka, Bangladesh and Zimbabwe. He retired from international cricket on 26 March 2008. The clubs current New Zealand Black Cap player is Jeetan Patel. Jeetan Patel is a right arm off spin bowler. Prominent administrators include Jack Phillips, Harold Osbourne, Nigel Gini and Wellington and former New Zealand selector Don Neely MNZM MBE (a former President of New Zealand Cricket). Over the history of the Club, it has been extremely successful. Midland have been Senior Champions on 27 occasions, 3 while playing as Easts when district cricket was introduced before World War 1, Kilbirnie on 18 occasions, and St Pat's, MSP or Eastern Suburbs on a further 4. Since amalgamation, the Club has won the Royal Visit Cup for the club with the highest number of points in every season but three. In the last 17 years the Easts Premier team have won the PEARCE CUP 15 times !!! The Club’s home ground and clubrooms are at Kilbirnie Park, situated near the airport and adjacent to the Wellington suburbs of Hataitai and Kilbirnie.